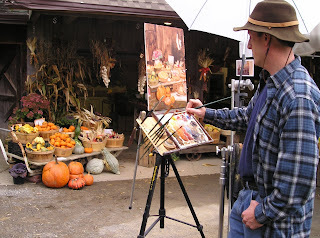 To celebrate autumn, here’s a step-by-step painting demo from a local farmstand. The pochade box is set up on a camera tripod, with the white umbrella mounted on a C-stand nearby. It’s an overcast day, so the umbrella isn’t really necessary as a light diffuser, but it protects against occasional sprinkles of rain. To speed up the painting, I spent about 15 minutes premixing little piles of the main colors of the scene: dull yellow, orange, red, and cool gray. For each hue, there are about four or five separate steps of tone or value. The palette cups hold Grumtine turpentine and Liquin. The brushes and palette knife hang off the board on the left. Here are the basic shapes sketched in with a bristle brush using burnt sienna and raw umber thinned down with turpentine. Now the tones are lightly washed in transparently, just to cover the whiteness of the canvas. Here it is about an hour and a half along, with the pumpkins in the foreground and the basket of ornamental gourds at left finished. Time is racing by, and customers keep coming up and trying to buy the gourds. Here’s the finished painting after about four hours of work time. This was a "paint out" day, so it had to be auctioned off as a wet painting later that afternoon. This amount of painting would have taken about four days in the studio. There’s something about the urgency of being on the spot that speeds up painting decisions. But the real secret to painting fast either in the studio or on the spot is premixing pools of color, because otherwise most of the time is wasted with color mixing. Wow, great tip! Never thought of premixing the colors...Your BLOG is great. Thanks for the demo! I am always fascinated by how each artist approaches a painting. This is awsome. A perfect post and a perfect painting for the season. I love it. I want to eat all that stuff.